THE CUMBRIAN INSPIRATION FOR LILLIPUT? 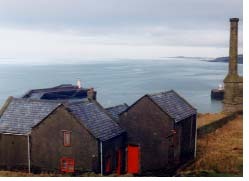 THERE is a former inn that overlooks Whitehaven harbour known by many as Jonathan Swift's house. But the reason for this association with the creator of Gulliver's Travels is still the subject of argument among historians. There is no doubt however that the infant Jonathan Swift was brought to Whitehaven and the view of the bustling town from the cliffs above was likely to have lodged in the young child's mind. Bruce Arnold, from Glenageary near Dublin, is the author of a Swift biography. 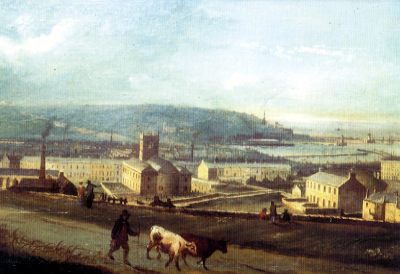 In March of 1999 he wrote: "I recently persuaded the National Library of Ireland to purchase the rare early 18 century engraving of Whitehaven, by Richard Parr, done from the Mathias Reid view and based on one of his paintings. "I regard Whitehaven as of crucial importance in Swift's infancy, and the survival of the house at Bowling Green as immensley important. Its preservation and restoration should be undertaken, and I believe that, internationally, there are organisations and possibly individuals who would help in this.'' "Swift was born in Dublin in 1667. The members of his extended Swift family were involved in the legal profesion, which then centered its activities around Christ Church Cathedral. The Law Courts were beside the cathedral. "In the spring of 1667 Jonathan Swift, full cousin to the poet Dryden, and steward to the Society of King's Inns, Dublin, died in poor circumstances leaving a widow. Seven months later, on the 30th of November, in a little house in Hoey's Court the poor widow gave birth to a son who was named Jonathan after his dead father, and whose life, began thus miserably, was fated to be one constant round of warfare and suffering, of defeat in victory and of disappointment in success. Born with a spririt fitting him to rule, the greatest satirist of England felt in the very first years of his life the cold hand of poverty pressing him to the earth and branding him a slave. "From his earliest days there seemed to be something in Swift's life different from other men. His father had been buried at the expense of the society he served; his mother and himself were kept in existence by the scanty, and we believe necessarily scanty, bounty of his uncle Godwin. Still, it seems he had a nurse, and this nurse like other women in after days became so attached to him that when she was called away to England to the death-bed of a relative she carried him with her clandestinely. After she was found the mother refused to insist on taking the child from her, fearing that because he was delicate he might not be able to stand the fatigue of a voyage from Whitehaven to Ireland. So in Whitehaven Swift remained three or four years, and there learned to read the Bible with ease. "When he was about five years of age his nurse carried him to Ireland again, where alas! there was now no kind mother to receive him, she having gone to live with a relative at Leicester in England. The little waif was taken into the family of his uncle Godwin, by whom he was sent to Kilkenny school when he reached six years of age, and there he remained for about eight years. According to Sir Walter Scott, his name, cut in school- boy fashion upon his desk for form, is still shown to strangers. There he learned to celebrate his birthdays by reading from Job the fierce passage in which that patriarch curses the day in which it was said in his father's house "that a man-child was born," and there, no doubt he suffered many an indignity from the poverty-stricken state in which he was maintained by an uncle who seemed (but in reality was not), rich. " 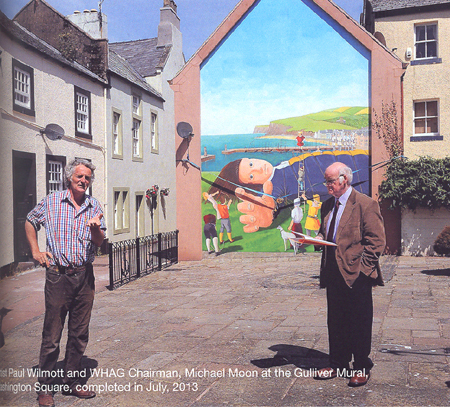 A 2016 booklet by Margaret Crosby "A Passion for Whitehaven" outlines the work of the Heritage Action Group, inclduing funding this 2013 mural showing the town's connection to Gulliver's Travels and Jnoathan Swift. Recently... The argument over the future of "Jonathan Swift House" is continuing as its owner is threatening demolition if badly needed repairs are not undertaken. But Copeland Council says that the owner of Jonathan Swift House has failed to present proposals invited in February. Edward Caley-Knowles, who lives at the house in Prospect, Kells, claims that flooding from council land has caused the damage to his house for the past nine and a half years. And now, literary editor of the Irish Independent and author of a Swift biography, Bruce Arnold, has written to the council asking for action to be taken to prevent further deterioration. It is reputed that author of Gullivers Travels, Jonathan Swift, lived in the house, between 1668 and 1671, when he was between the ages one to four. But Mr Knowles even goes so far as to claim that because of doubts surrounding the authors birthplace, that Jonathan Swift was born in the house. Indeed, Parsons and Whites 1829 Directory states that he was born in Whitehaven. Mr Knowles said: A report by structural engineers in 1985 stated that repairs to the building would cost £15,000 and that was 14 years ago so it will cost a lot more now. Brain White, head of development and environment at Copeland, said: In February we invited Mr Knowles to send us proposals for work to be done at the house, which we could then process and look at gaining grant aid from the appropriate bodies. He has never come up with a proposal. We are always willing to hear from people who are having problems with their property and are able to offer advice and help. There are various ways in which funding may be obtainable, such as through historical buildings grants or conservation grants, but we need a proposal from Mr Knowles or Mr Arnold before we can do that. If he wishes to make a grant application we will be happy to consider it. With regards to the flooding, that is a civil matter and one that is separate from the proposal for grant application. A legal battle between Mr Knowles and Copeland was discontinued three years ago. * Jonathan Swift House (See Illustration) is a Grade II listed house, formerly known as Red Flag. It stands close to the candlestick chimney overlooking Whitehaven Harbour, the Irish Sea and the Solway Firth. Mr Edward Caley Knowles (An intelligent and Swiftian character himself) bought the property in 1954. A Department of Environment survey as part of the building's Listing states it is "Evident that this is one of the oldest surviving buildings in Whitehaven and predates the main development of the town in the early C18. It is certainly the same building clearly seen in the Matthias Reed drawing of 1738 and other contemporary pictures. It is not. however, very likely that it is the house stayed in by the infant Jonathan Swift, who, it is claimed, lived there 1668-1671. During the C18 it was an inn known as Bowling Green House (complete with bowling green that would have given a dramatic seascape setting for a game) and later Flagstaff House and Red Flag.'' Read more about Mr Knowles. * Swiftian footnote... Local historian the late Harry Fancy once said that: " In the Beacon Centre Collection at Whitehaven there is a "wood" (i.e. bowling ball) nicely inscribed - (going from memory) Whitehaven Bowling Club, 1796. There can't be too many of that vintage anywhere, and this was probably used at the Red Flag Bowling Green. Probably worth having a look!" Copyright &COPY; Lakestay All rights reserved.